As if to prove that it hasn’t forgotten its roots, Disney periodically makes new cartoons with its classic stars. Mickey’s Christmas Carol (1983) and The Prince and the Pauper (1990) are the most recent cartoons to feature Mickey Mouse, Donald Duck, Goofy and others. Released straight-to-video, The Three Musketeers is entertaining but not memorable, with some DVD extras that are worth a look. The introduction of the story with a comic book is an early indication that this won’t be a faithful adaptation of the classic Dumas book. 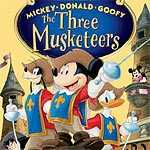 We learn that Mickey, Donald and Goofy, living in 18th century France, idolized the musketeers as youngsters. But instead of following in their footsteps, they are stuck working as janitors at the royal palace. That is, until the captain of the musketeers, the villainous Pegleg Pete, plans to kidnap Princess Minnie, and claim the throne. When Minnie demands bodyguards, Pete promotes the three inept servants and assigns them to the task. The heroes go on to have some wacky adventures and find romance. The best gags seem to be inspired by classic Disney shorts, and they elicited chuckles from the adults watching the DVD. That the plot is thin and padded with songs won’t bother young viewers, but this movie will never be considered a classic. The extras are above average for a straight-to-video production. The funniest one has cast commentary for one scene, featuring the voices of Mickey, Donald, Goofy and Pete in character. In the Games and Activities section, The Many Hats of Mickey invites viewers to move the cursor to a hat that Mickey Mouse wore in his earlier cartoon career. Clicking on the hat leads to a 45-second clip of a classic Mickey cartoon. The disc also has some deleted scenes with commentary by Brain Snedeker, an executive involved with the production. The quality of the scenes range from storyboards to completed animation and offer a look at the process of animation and story development. A 10-minute behind-the-scenes featurette gives a further look at how the movie was made. Like all animated DVD releases from Disney, the picture quality is high – a step below that of Disney’s theatrical releases, but better than their animated television shows. The sound quality is good too, and the film makes good use of surround.